Oh my goodness. I love this game. Prior to purchasing Zoologic, Rush Hour Jr. was my favorite single-player puzzle game for my 5 year old. However, now they are at least tied. If anything, I like this game slightly more. 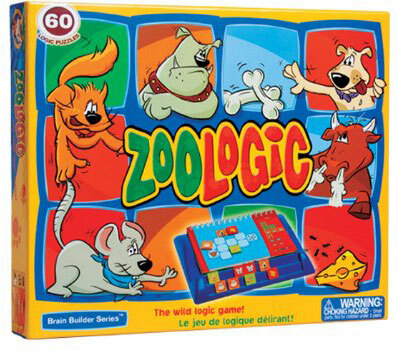 I think Zoologic will last several years and requires more critical thinking skills than any of the other puzzle games we’ve purchased so far. Comments: I love puzzle games. I’ve loved them my entire life. Multiplayer games are fun too, but they are mostly fun for the interaction. Puzzle games are fun all on their own, simply for the pleasure that comes with solving a challenging problem. I want my kids to become familiar with this sense of satisfaction. I want them to know the joy that is possible when we work hard on something difficult and finally figure it out. When I was a kid, I used to always love doing logic puzzles. The kind with little boxes that you “X” out to say that Suzy won’t sit next to Timmy or that Fred likes to play soccer. When my kids are a little older, I definitely need to find one of those books. However, really, this game is even better. It poses similar sorts of problems requiring you to organize all the information and figure out where everyone goes, but you get to solve the problem in a hands on way with real pieces that you move around. Basically, there are 4 animals (mouse, cat, dog, and angry dog) and 3 foods (cheese, fish, and bone) and rules about who can’t be next to what. Each animal can’t be placed next to a food that they will eat (such as a mouse next to cheese) and each animal can’t be placed next to their enemy (like a cat and mouse). Basically, you have to place all the animals on the board to maintain a very careful balance where everyone is happy. This is really easy to teach to kids, because if my 5 year old accidentally placed a mouse next to cheese, I would pick up the mouse tile and move it over to the cheese saying “om nom nom…yummy yummy”. If he put a dog next to the cat, I would pick up the dog and say “woof woof woof” in a gruff voice to the cat. He got it. This is the sort of thing kids are great at understanding. However, while he was able to do the first several puzzles (out of 60), he’s not that good yet at thinking logically and sequentially. He’s still in more of a trial-and-error stage, but that’s perfectly okay. He’ll get there. However, the main reason why I think this game is amazing is that my husband and I (both with PhDs in engineering), had a blast trying to solve the last puzzle. One night, after the kids went to bed, I decided to try it just to see how hard it was. I’d been working on it for about 5 minutes when my husband came over to see what I was doing. He immediately started to “help” which is really hard in a one player game, so I just let him have a turn first since I had other things to do anyway. Over the next several minutes he said about 3 times, “I think I got it!…No, wait.” Finally, about 20 or 30 minutes later, he finally said, “I did it!” I said, “Great! Now take all the pieces off. I don’t want to see the answer.” Another 20 or 30 minutes later, I finally got it too…WAY past my bedtime. So basically, given that even my 3 year old can do the first puzzle and the last puzzle is fun for the nerdiest of adults, I have to assume that this puzzle game is great for everyone. I highly recommend it. This may make it onto my Christmas list. It sounds like a great find for my six-year-old, who loves Rush Hour, Jr. If you decide to get it, I hope he likes it! I think it would make a great Christmas gift. I love your game recommendations! You always provide so detailed reviews!